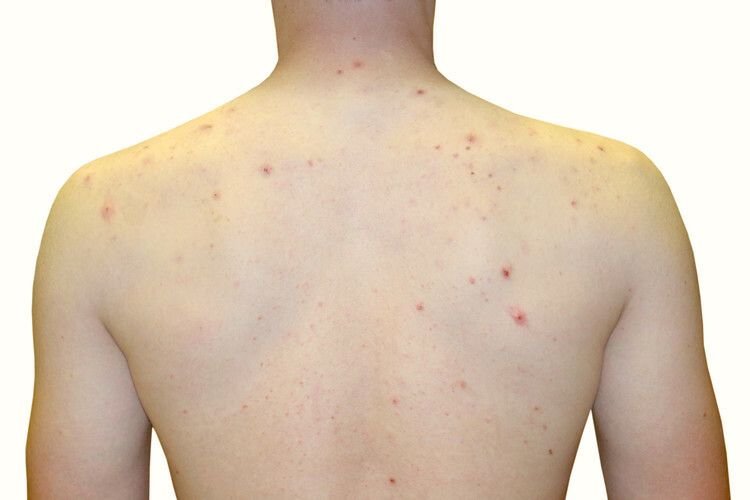 If you have body acne (sometimes called, "Bacne"), you should know that it’s common. If you’re bummed about it, we’re here to help! There are tons of steps you can take first to avoid bacne, and then, if you do have it, to get rid of it. What is the cause of back acne? Bacne’s frequently caused by humidity, sweat and skin friction. If you’re sitting for long periods of time a day (Like at school, at your desk), the heat, sweat, and friction can cause pimples. One way to reduce these pimples is to try and find a chair to sit in where the lower back area’s ventilated to help your skin breathe. Whenever you’re working out, try to avoid wearing tight clothes — those keep the sweat in and rub against your skin. Wear workout clothes that wick away the sweat and keep your body cool. Always shower at least once a day, and shower immediately after breaking a sweat. Staying in your sweaty clothes can irritate the skin and trigger body acne and folliculitis, which is the name for infected hair follicles. Speaking of laundry, make sure you’re always on top of washing your clothes. Items, like your hoodies, can harbor dirt and bacteria. Even if you’re only wearing a hoodie for a short period, make sure you wash it — you don’t want any bacteria from it to transfer onto your skin! Acne on the shoulders can be caused by straps of your handbag or backpack rubbing on your skin. (just try to avoid any friction on this area). How can I get rid of back acne fast? Once you took care of the causes of body acne (listed above), it’s time for treatment. The best treatment will include a medicated cleanser and leave on anti-acne medications that you would apply for the areas for body acne at night. What are the best cleansers for body acne? The best cleanser for body acne will do five things: Unclog your skin pores, kill bacteria, kill fungi, reduce inflammation (redness) and help fade post-acne dark spots. The best active ingredient to look for in the perfect body acne cleanser will be salicylic acid 2% (unclog pores, anti-bacterial and anti-fungal and reduces inflammation). Salicylic acid that is a beta hydroxy acid (BHA) is especially helpful for all skin types. An excellent example of such a cleanser in the MDacne body cleanser. It includes in addition to salicylic acid, Aloe Vera leaf extract, a powerful antioxidant that hydrates and soothes your skin and Licorice extract and green tea extract that helps fade dark spots, even skin tone, and boost the skin's natural healing. Body acne can be caused in part by a normal fungus that lives on the skin, and ketoconazole or zinc pyrithione may help fight this fungus. Thus, for more anti-fungal activity one can use on the body 2-3 time a week a dedicated anti-fungal shampoo, that contains ketoconazole or a zinc Pyrithione bar soap. What are the best topical creams to the treatment of body acne? Similar to face acne the best “leave on” treatment cream for body acne, on the back, chest, and buttocks, are creams with micronized benzoyl peroxide. Benzoyl peroxide Is a potent antibacterial, unclogs pores and reduces inflammation. A few body acne treatments include, in addition to benzoyl peroxide, plant-based boosters. Some of the more beneficial natural ingredients that are synergistic with benzoyl peroxide and can boost your body acne treatment are: Tea tree oil, that is a potent antimicrobial and antifungal with proven medical-grade efficacy for acne, licorice extract and green tea extract that help fade post-acne dark spots and boost your skin's natural healing and lastly cucumber extract that enhances the natural protective layer, and decreases sebum production. How to use your body acne treatment for best results? Every night (and or morning) shower with your body with the MDacne body cleanser. After the shower, pat dry your skin and apply a thin layer of your body acne treatment cream to the areas on the body affected with acne. For the back use half of your index finger length of the cream and for the chest a quarter of your index finger length. Do not apply your body acne treatment cream to your face, the sensitive skin of your neck or genital areas. Wash your hands thoroughly with soap after you apply the cream. Touching sensitive skin areas by mistake can cause skin irritation. Leave your body acne treatment on the skin to dry for 3-4 minutes before you dress. Be mindful that your body acne treatment cream can bleach colored clothing. Consider wearing a white t-shirt to bed after application. What not to use when you have body acne? Do not use a loofah or rough waging cloths on your skin. Rubbing and friction are the worst you can do for your body acne. It will damage the skin's protective layer and most probably make your body acne worse. Same is true for rough scrubs and electric cleansing brushes. When will I see improvement in my body acne? Body acne can be stubborn. You need to be patient. As with other acne treatments After four weeks, we expect to see some improvement in the skin and optimal results by 10-12 weeks.